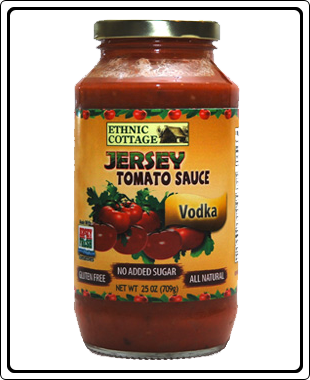 Decadent and full of flavor, this Vodka Sauce is a rich blend of Vine Ripened Jersey Fresh tomatoes, fresh cream, vodka, and Romano cheese. Top the cooked penne pasta with smoked salmon and this sauce. Finish with shavings of parmesan cheese for an easy and elegant weeknight meal for your family. Ingredients : Vine Ripened Jersey Tomatoes, Onions, Fresh Cream (milk, milk fat), Extra Virgin Olive Oil, Fresh Garlic, Romano cheese (milk, salt, cheese culture, enzymes), Butter, Denatured Vodka (vodka, salt), Sea Salt, Fresh Basil, Fresh Oregano, Black Pepper and Crushed Red Pepper.